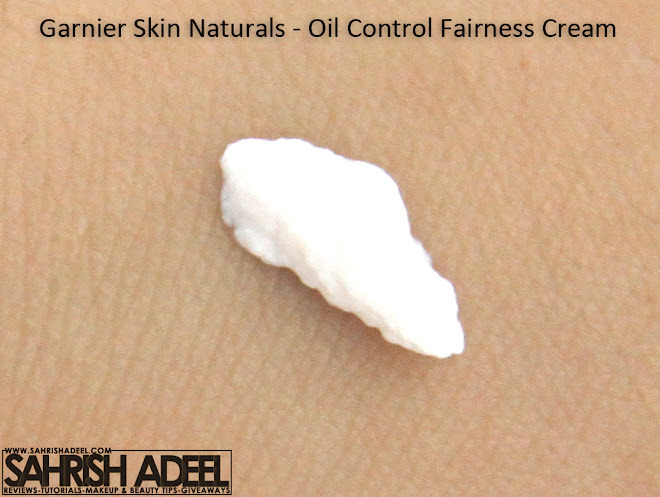 Oil Control Fairness Cream by Garnier - Review & Swatch! | Sahrish Adeel - Malaysia based Pakistani Beauty & Lifestyle Blogger! 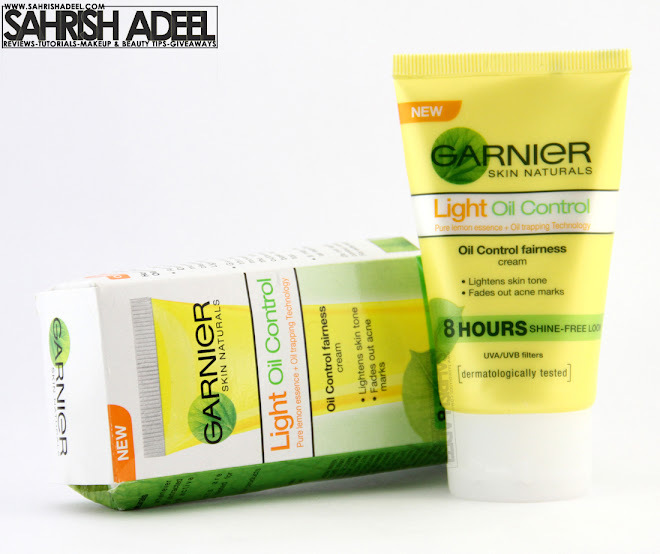 Oil Control Fairness Cream by Garnier - Review & Swatch! For me, fairness has never been something to worry about. I am satisfied with my skin tone. I enjoy and appreciate it while I can. However, I try to minimize the imperfection my skin is getting with time. When I received this cream, the only thing I thought about minimizing some spots on my face while keeping my skin matte for long hours. Let's see if anything I expected happened really. They say: 'The naturally sourced Garnier Light Oil Control Fairness Cream is the latest innovation within the Garnier Skin Naturals Light range, which stands for fairness. The cream contains natural lightening power of lemon essence, renowned for whitening the skin tone, fading acne marks and providing flawless fairness. This natural power is combined with a unique oil trapping technology, which gives the skin shine free, matte based fairness lasting upto 8 hours. This cream comes in a plastic, squeezable tube and comes with a flip open lid. It comes in a card box. It also has all the instructions and ingredients written over it. The packaging comes in two quantities; 40ml & 20ml. Creamy & mousse like texture. Has a really nice lemon scent. Feels light on skin and is hardly noticeable on fair to medium skin tones. Gives a matte finish to the skin instantly. Brightens up the face moderately. Does not keep skin matte for 8 hours. Not exactly a 'fairness cream'. Not suitable for darker skin tones since it leave a whitish layer on skin. I posted about this product when it was launched and I was kind of excited to know that there are some creams that even people with oily skin can use to stay matte. I finally got to try it and honestly, I was expecting a dream-come-true product. I seriously did not expect it to keep me matte for 8 hours because nothing could keep my face matte for that long without a touch up. But still I expected it to keep my skin matte for like 5-6 hours. It didn't, my face starts to get oily in about 3 hours and it is shinier than usually. I wore it under foundation as well, and my face gets shinier sooner than it usually does. It also leaves a white layer on the skin which is not really noticeable and looks like the face is brightened up which is fine and does not look odd at all. But it makes the foundation look whitish a bit which can be settled by using a bronzer or another layer of foundation. For the good parts, it smells absolutely amazing and fresh. It has lemon scent and it stays till I wash my face. I did not feel much difference in my skin after a use of about 20 days, but since it has lemon extract, I am hoping that it will minimize some spots or may be discoloration with continues use. When I apply it on my face, it suddenly feels dry but gets blended easily leaving a smooth and matte skin. Unlike other daytime creams, this does not feel heavy on skin at all. I tried to go out in humid and hot weather and I only felt bearable and not-so-sweaty heat on my skin. If you have used daytime creams before, you know what I am talking about. Sometimes, you apply a daytime cream and go to kitchen or outside, you feel like your have something really hot on your skin, you skin cannot breath and you sweat like anything. It is also moisturizing while keeping the skin matte for 3-4 hours, which is also good. I have used it under a powder foundation and for me, that one worked best to cut down the whitish feel and a touch up after 3-4 hours made it matte again for next 1-2 hours. Overall, I am not too happy with this cream since it does not do what it claims. I will only buy it again because for me it is a moisturizing cream for oily skin which makes my skin smoother and brighter on use while keeping it matte for 3-4 hours. My sister Rabiyah has also started using it on my recommendation. She has an oily skin type and has some light acne marks. These are her words, 'I have used a few creams before and this one does not make me sweat much. My skin has gone a bit rough due to acne I had in past but this cream leaves my skin smooth and fresh. It has a really good texture and is really easy to blend. I also love the scent. It keeps my skin matte for about three hours and after that, my skin starts to get shiny.' She is using it for about two days now. This cream is not for dry skin. People with oily and combination skin can try this cream but I am quite certain that it will not keep you matte for 8 hours. So don't keep your hopes high. For trial, go for a 20ml tube and buy the bigger one if you feel like it is good for you. 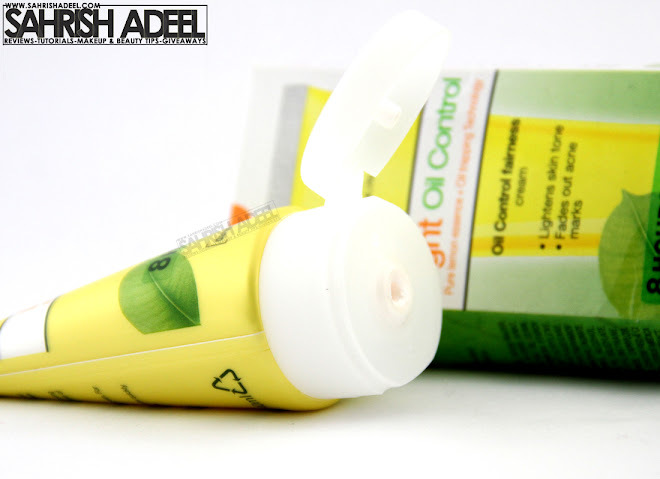 Oil Control Fairness Cream is available at all stores across Pakistan in 40 ml and 20 ml tube with a price tag of PKR 199 and PKR 99 respectively. Have you used this cream? Share you experience. Thank you for your time. Don't forget to Like, Tweet & in this post by sharing buttons below/above this post.